The exact cause of the dysfunction seen in HE is not yet known. Recent research in Japan has turned up the presence of antibodies to alpha-enolase (serum autoantibodies against the NH2-terminal of a-enolase3,4,5) in addition to the presence of other anti-thyroid antibodies in the serum. At this time, research into this avenue is ongoing but limited, and very few laboratories offer testing for these autoantibodies. 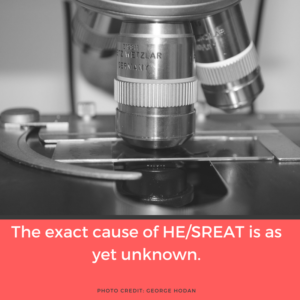 Although there is no definitive diagnostic criteria for HE itself, in February of 2016 Dr. Josep Dalmau et. al published the first broadly accepted criteria for diagnosing autoimmune encephalitis in the publication, The Lancet. The article is entitled, “A clinical approach to the diagnosis of autoimmune encephalitis,”and is available for purchase online via The Lancet. This important paper written by some of the top AE experts in the world offers guidelines for the diagnosis of antibody negative autoimmune encephalopathies such as HE. 2014 Vol.1, No.1, pg 2. 4 [Anti-NAE autoantibodies and clinical spectrum in Hashimoto’s encephalopathy].